WASHINGTON (AP) - Wearing gold-sequined Ugg boots, a bright smile, and flawless brown skin that belies her 82 years, Faith Ringgold explains her "confrontational art" - vivid paintings whose themes of race and racism, gender, class, and civil rights were so intense that for years, no one would buy them. "I didn't want people to be able to look, and look away, because a lot of people do that with art," Ringgold said. "I want them to look and see. I want to grab their eyes and hold them, because this is America." Look away they did. And they walked away. So Ringgold tucked the paintings out of public view, where they stayed for more than 40 years. 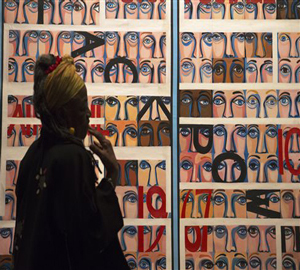 Now enjoying a revival, Ringgold's early works go on display on Friday, June 21, in a new exhibit in Washington, D.C.
"American People, Black Light: Faith Ringgold's Paintings of the 1960s," are now on display at the National Museum of Women in the Arts until Nov. 10. The exhibit includes 49 paintings from her "American People" and "Black Light" series of the 1960s and 1970s, along with earlier works and political posters created for activist Angela Davis for efforts in supporting the Black Panthers and the 1971 Attica prison riot. "I'm very happy and very pleased that this work is getting another chance to be seen and heard, and that the American people are getting another chance to take a look at themselves," Ringgold said in an interview. "Most of that work I still own because people just didn't want to look at it. They didn't want to see it." A Harlem native best known for reviving the popularity of African-American story quilts 30 years ago, Ringgold said she created the paintings in response to the civil rights and feminist movements during a time when race discrimination cases were highly prevalent. Ringgold, actively involved in both, championed displaying artwork by blacks and women, and protested outside the Whitney Museum and Museum of Modern Art in New York in the 1960s and '70s. The former University of California and New York public school educator said some cultural topics - like race and gender inequality - often resurface in cycles. "A lot of these issues have still not been addressed," she said. "This is typical, kind of - when there is a problem - the group that has the issue rises to the occasion and speaks out, and addresses some parts, but then when you look around, we're right back where we started. Throughout the history of the United States, this has been what has happened." Paintings from the "American People" series are vibrant and colorful, drawing influences from pop art and traditional African artwork, depicting a variety of racial groups - along with how they interact with each other in many of the pieces. Ringgold's mural "The Flag is Bleeding," depicts a white man, white woman, and black man linking arms and standing before an American flag splattered with blood, because of race riots common during that time. "When I started painting this blood, I just felt like 'Oh, my God,' this (is) blood, it just gave such an eerie kind of feeling," Ringgold recalled. "I had seen blood in the street. I had seen the effects of some riots and so on. But they were not in the newspapers, they were not pictured. They were not in news photographs - the blood part - and I wanted to bring that out." Ringgold, who illustrated and wrote an autobiography, and also wrote 15 children's books, is completing "Harlem Renaissance Party," published by Harper Collins next year.